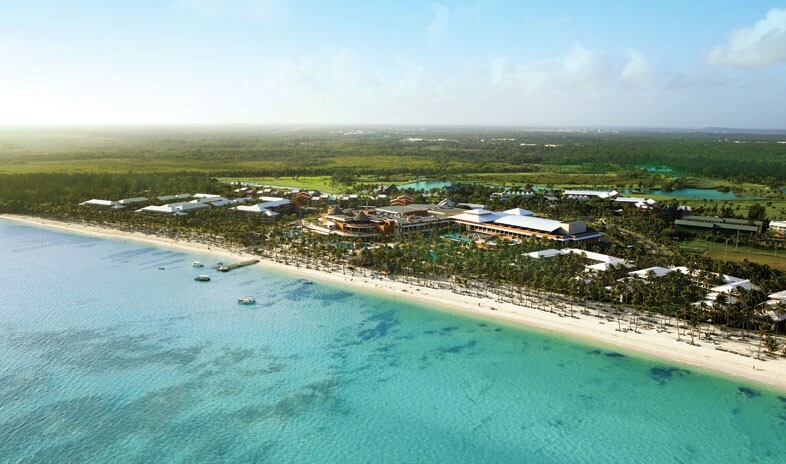 A mile-long swath of white-sand beach, a state-of-the-art conference center, 18-hole signature golf course, and an expansive dining-casino-entertainment complex firmly lands the all-inclusive Barceló Bávaro Beach Resort on the radar of meeting planners searching for a Caribbean work-play destination. Located on a coconut plantation just 15 minutes from Punta Cana International Airport on the popular eastern shore of the Dominican Republic, the complex offers two options: the family-friendly Barceló Bávaro Palace Deluxe and the adults-only Barceló Bávaro Beach. Together, they offer 1,991 guest rooms, from oceanfront Junior Suites and secluded Family Suites to an assortment of high-end beachfront executive quarters. Room amenities include flat-panel TVs, iPod players, wireless Internet access, private balconies or patios, and greens fees with upgraded accommodations. The Barceló Bávaro Convention Center features 24 flexible venues that accommodate everything from an executive board meeting to a 5,000-capacity corporate event. Designed around pools and gardens that supply abundant natural light to its meeting spaces, the center also includes a dedicated kitchen, business center, secretarial services, and on-site heliport. Activities for every age and interest abound. For the recreationally inclined, four swimming pools, the Barcy Water Park, Pirates Island Water Park with wave pool and slides, full-service U Spa, gymnasium, tennis courts, water sports, beach volleyball, and The Lakes Golf Course by P.B. Dye offer a choice of tropical workouts. Indoor activities center on the 24-hour casino, 14 international dining venues, adult and teen-friendly discos, and the Las Vegas-style nightly entertainment at the 1,400-seat Gran Teatro Bávaro.